Mediaeval Eastbourne lay around the parish church of St Mary, between the shore, the Downs and marshes to the east and over a mile from the sea. The marshes were reclaimed and added mostly to the neighbouring parish of Willingdon. The fine late C12 work in the church and the C16 old parsonage show Eastbourne was wealthy, though slow to develop. An estate with a Jacobean house, Compton Place (remodelled in the C18), between the town and the sea passed in the C18 to the Dukes of Devonshire, who planned a resort there, first known as Southbourne. By 1800 there were houses on the sea front and Holy Trinity, Trinity Trees was built there in 1837-39. It was the first of seven districts created out of the original parish by 1890. Southbourne was small and select and only after 1850 did major development begin with broad avenues and large brick houses, especially in the Meads area. Land west of the town, owned by the Gilbert family, which had been settled in Willingdon at least since the later C16, was built up from the 1870s. The area between the station and the sea is mid-Victorian with stucco houses and the finest C19 church, Street’s St Saviour of 1867-69. Like other churches in the town it is large, for Eastbourne attracted older people, some of whom left handsome legacies. However, there was no dominant and recurring donor like the Wagners in Brighton. Apart from Street, few nationally known architects worked in Eastbourne. Most local ones were not up to working on the required scale, so the churches fall short of their equivalents in Brighton or Hastings. The oddest, judging by the surviving tower, was St John, Meads, started in 1868 and gradually rebuilt and extended until it was destroyed in World War II. T E C Streatfeild’s All Saints shows a renewed interest in French gothic of the late 1870s but was largely rebuilt after a fire in 1927, whilst G E S Streatfeild’s St Michael, Willingdon Road is chiefly remarkable for its size. The eastern side of the town developed more modestly with terraced housing. 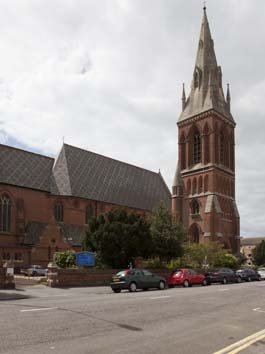 The first church was Ferrey’s Christ Church, Seaside Road, begun in 1859, but more remarkable is A P Strong’s All Souls, Susans Road (1882). Built by Lady Victoria Wellesley, a great-niece of the Iron Duke, it is, uniquely for its date, in the Italo-Byzantine style. More conventional are two early C20 churches, St Philip (1903 but demolished in 2004) and St Andrew (1911). St Philip in particular carried the ‘basic gothic’ of this period to excess, despite a well proportioned interior. After World War I, expansion along the coast ceased and Eastbourne grew along the main road towards Polegate, four miles inland, absorbing Willingdon with its old church, St Mary. New churches of this date are small except P D Stonham’s St Elisabeth (1935-58), which still rises dramatically above its surroundings, though probably not for much longer. A surprising number of churches were destroyed or damaged in World War II and afterwards there was considerable reconstruction. Most prominent is the present St John, Meads by A E Matthew and others (1955-57). Maufe’s St Mary, Hampden Park, though not his finest even in Sussex, was one of the first post-war churches to be listed.